In 1963 two 16 year old convent girls were walking home at night after having visited friends in Highgate Village. Their return journey took them down Swain's Lane past the cemetery. They could not believe their eyes as they passed the graveyard's north gate at the top of the lane, for in front of them, bodies appeared to be emerging from their tombs. Another incident, some weeks later, involved a couple who were also walking down Swains lane. The lady recorded glimpsing something hideous hovering behind the gate's iron railings. Her fiance also saw it, and both stood frozen staring at it for what seemed like several minutes. Its face bore an expression of absolute horror. Soon others sighted the same phantom as it hovered along the path behind the gate where gravestones are visible either side until consumed in darkness. Some who actually witnessed the spectral figure wrote to their local newspaper to share their experience. Discoveries were made of animal carcasses drained of blood. Very soon it was being described as a vampire. In 1971 several years after the many publicised vampire sightings, a young girl claims she was actually attacked by the vampire in the lane outside the cemetery. She was returning home in the early hours of the morning when she was suddenly thrown to the ground with tremendous force by a "tall black figure with a deathly white face. At that moment a car stopped to help her and the vampire "vanished" in the glare of the headlamps. She was taken to the police station in a state of shock, luckily only suffering abrasions to her arms and legs. The police immediately made a thorough search of the area, but could offer no explanation to the incident. More mysterious still was the fact that where the vampire vanished, the road was lined by 12ft walls. Another interesting case is that of the man who was hypnotised by something in the cemetery. He had gone into the cemetery one evening to look around, and as the light began to rapidly fade he decided to leave, but became hopelessly lost. Not being a superstitious person he walked calmly around looking for the gate when suddenly he became aware of something behind him. Swinging around he became "hypnotised with fear" at the tall dark figure of the vampire confronted him. So great was the intensity of his fear that he stood motionless for several minutes after the vampire vanished. He later recalled that it was almost as if he had been paralysed with fear by some force. Thirty years later, David Farrant is a leading expert on the Highgate Vampire, and tends to discount the vampire label as an unfortunate consequence of the popularity of hammer horror amongst the public at that time. He maintains with absolute certainty that the Highgate Vampire was neither a hoax nor a vampire, but nevertheless it was something very real. In David Farrant best selling book on the subject, Beyond the Highgate Vampire, David claims that ley lines, may be an important factor that has been left completely out of the Highgate equation. These lines, he says, can actually transmit psychic energy along their course and enable the vampire to materialise when the right conditions prevail. One such ley line, he points out, apparently begins in the middle of Highgate Cemetery at a large circle of tombs called the Circle of Lebanon, crosses through the Flask and Ye Olds Gatehouse pubs (both ancient pubs only yards from Highgate Cemetery); traverses a large block of council flats known as Hillcrest (themselves built upon the site of an ancient nunnery) and passes through an old Roman Settlement a quarter of a mile or so away in Highgate Woods which is marked by an old beech tree. For without exception, all the locations on the Highgate ley line, were reportedly haunted by a 'tall black figure' which, even when it was not actually seen, it caused dramatic drops in temperature, clocks to simultaneously stop, objects to fly from shelves or mysteriously shatter, and which also had a dramatic effect upon animals in it's immediate vicinity. Today, all of these locations are still affected by continuing spates of psychic activity; the latest having seemingly come to life again in the Flask public house, while a black-clad figure is again being reported at Highgate Cemetery. 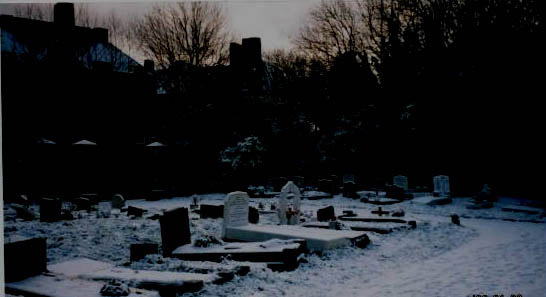 There have again been recent reports of a 'tall black figure' seen in Swain's Lane outside the cemetery, and only this February a lady driving her car up the Lane one night saw a tall dark figure about 7 feet tall with luminous eyes that suddenly disappeared through the cemetery wall. A man out walking his dog had also seen the vampire near the old Roman Settlement in Highgate Woods the same month, which abruptly disappeared without trace. Swain's Lane outside the cemetery also has its own weird happenings. Some time in 1974 a dog walker on returning to his car in Swains lane, found there was a freshly dug up corpse in his car. Bizarrely, the doors were still locked. At the time there were all sorts of strange rituals being carried out in the cemetery late at night.